Weekend meal sharing is moving! Beginning Saturday, March 30th, weekend meal sharing will take place at the new Oak City Cares located at 1430 S. Wilmington St. If you have questions about the move, please contact Tosheria Brown at Tosheria.Brown@oakcitycares.org or visit www.OakCityCares.org. Check out the celebration we held on Sunday, March 24th in recognition of this move. The mission of the Oak City Outreach Center is to provide a place of hospitality on weekends where people can gather to receive and give nourishment that comes from sharing of food and fellowship. As one of the leaders of the churches providing food said, we hope it will be a place “where everyone knows your name” and everyone is welcome. In the fall of 2013, the City of Raleigh established a Community Task Force to determine how best to provide food assistance on weekends to people in the downtown area who are experiencing homelessness and/or a lack of food. For the past two decades many churches and non-sectarian organizations faithfully provided food on weekends at Moore Square. Representatives of these groups were invited to be on the Task Force which, after several meetings, recommended the establishment of a Center where food could be provided on weekends in an indoor facility. The Raleigh City Council enthusiastically endorsed this recommendation and authorized funds to renovate the 3,200 square foot city-owned warehouse behind the former Salvation Army building across from Moore Square at 215½ Person St. This new Center opened on June 14, 2014 and is called the Oak City Outreach Center. The City of Raleigh contracted with the Raleigh Wake Partnership to End and Prevent Homelessness to choose and oversee an organization to operate the Oak City Outreach Center. The Partnership is very appreciative of the City for providing such a wonderful facility to provide a place of welcome on weekends for groups to share a meal with people experiencing homelessness or who simply need a meal. After receiving many proposals, the Raleigh Wake Partnership to End and Prevent Homelessness chose Catholic Charities to be the coordinating agency for the new Oak City Outreach Center. Catholic Charities has provided social services to the people of Raleigh since 1898 and last year provided services to almost 49,000 people in Wake County. Catholic Charities has been a leader in emergency food aid in Wake County through Catholic Parish Outreach Food Pantry which provides a week’s worth of groceries to an average of 11,000 per month. Catholic Charities also has been serving people experiencing homelessness since 2005 through the Support Circle Program for Homeless Families. Catholic Charities is very humbled to partner with so many faith communities , agencies and other humanitarian organizations who have been so faithful for so many years in providing food for people in need on the weekends in downtown Raleigh. Catholic Charities role is to recruit and schedule faith communities and other organizations who wish to provide food on weekends at the Center. Catholic Charities also recruits and trains volunteers to serve as hosts to the organizations providing food as well as the guests coming to receive nourishment. The Oak City Outreach Center is a community collaboration of many groups and faith communities who come together to create a modern day miracle of feeding the multitudes through the sharing of the gifts of those willing to share. 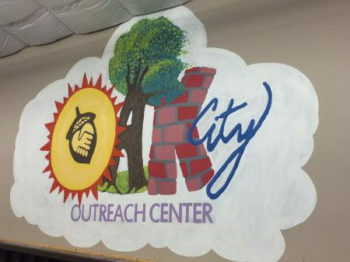 The Oak City Outreach Center serves food to guests every Saturday and Sunday from 9 a.m. to 6 p.m.
Set up tables and chairs in the Center and outside the building depending on how many people we expect. Prepare water and lemonade to supplement the drinks supplied by the food providers. Place trash cans by the entrances and at other convenient locations throughout the building and outside. Empty trash cans into dumpsters throughout the day. Welcome groups who come to the Center to provide food and provide clear instructions to participating organizations/faith-based groups with regards to food distribution layout, clean up procedures, etc. Greet guests, orient them to the Center and explain how food will be distributed. Engage in conversations with the guests to encourage a sense of community. Provide information and referrals about services for the homeless to guests desiring such information. (Training will be provided along with a resource guide). Mediate any conflicts that might arise with guests and/or the food providers. If a conflict is not easily defused by the volunteer Hosts, a Raleigh Police Officer will be present if needed. Ensure that the facility remains clean throughout the day and at the end of the day. The City will provide weekly major cleaning of the facility. Assist the food providers in cleaning up after the meals. Wipe off tables and sweep floors between meals if needed. Check bathrooms to make sure they are clean between meals. At the end of the day Sunday, move dumpsters to location where the City can empty them (place to be determined). Keep records of how many were served and other statistics as needed and report these to the Coordinator of the Center.